Is your child ready to read? In today’s educational world, this question is not being asked enough. Instead, we skip worrying about being ready and throw our 3, 4 and 5-year-old children into reading programs in hopes that they will be launched into academic success. Research indicates that forcing a child to learn to read before they are ready can actually be harmful. How do you know if your child is ready? Here is my list of readiness signs to check your child against. Sings of reading readiness can be divided into two categories: physical and language. The physical indicators of reading readiness are often the most overlooked. But they are critical to success in reading. Many children do not attain all of these skills until age 7 or older. It is okay to delay formal reading instruction until then. In fact, most previous generations actually taught reading closer to age 7 or 8. Giving your child time to develop these skills is not going to put them behind academically and waiting until your child is ready to learn to read can make the entire process go more quickly and smoothly. 1. Can your child skip using opposite sides of the body? Can your child swing one arm while hopping on the other foot? This means that the body has physical connections between the left and right sides of the body. 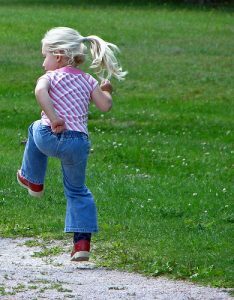 If your child cannot skip, work on hopping on one foot and then the other to get them started. Demonstrate for them how to skip and encourage them to keep trying. If your child has a disability that makes skipping unreasonable, work on being able to play hand clap games where the child claps, then slap hands with a partner in a rhythmic pattern. Being able to play more complex games like this also indicates that the left and right brain are working together. 2. Can your child Cross midline? Does your child regularly reach across their body with one hand, grasp an item and bring it back across their body, without switching hands? Younger children, whose brains have not matured, will switch hands when they get in front of the body. Being able to hold onto something in one hand crossing across the front of the body indicates that the brain has no trouble shifting an item from left to right or right to left as words move across a page. 3. Can your child follow an object with their eyes? Hold a small toy or pencil topper about 12” from your child’s face at nose level. Move the toy across their line of sight left to right and right to left. Watch to make sure their eyes can smoothly follow the item without jumping. If the child’s eyes “jump” when crossing midline they will have trouble tracking words across a page. 4. Can your child stand on one foot for 10 seconds with eyes both open and shut? 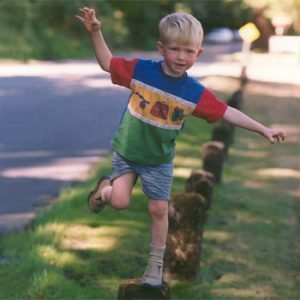 Children who struggle with balancing on one foot are still developing the brain and body connection needed for reading. The closed eyes test indicates whether a child has a good sense of where their body is in space even without visual cues. If a child needs to maintain visual cues around them to sit still, stand on one foot or other physical activities, they do not have the extra energy to focus on reading. They need to use their eyes to look around the room for visual cues to help them maintain body awareness. Yoga can be helpful for children who struggle with these skills. 5. Can your child draw themselves with at least 10 body parts without cues or prompts? This is a sign your child both knows their own body and can relate it to paper. 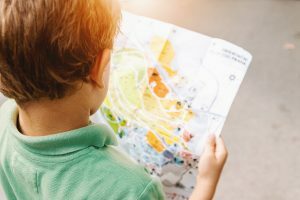 The steps of being able to relate where in space their body parts are and where that means they should put it on paper indicate a child’s brain is ready to relate to the differences between letters. As an occupational therapist, I use a program called Mat Man from Handwriting Without Tears to teach this skill. 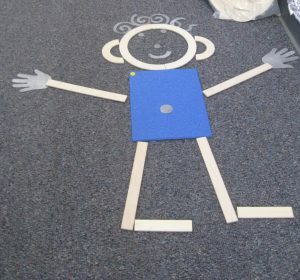 First, we build a person from wooden pieces and foam cutouts, while pointing out the child’s own body parts. Then the child draws themselves on paper. This process helps the child relate their body to paper. A. Does your child look at books and words? Before being ready to read on their own, children should be interested in helping you “read” a story, by looking at the pictures and turning the pages in their favorite books. B. Can your child make rhymes and play word games? Children who can hear the ending sounds of words and can make up rhymes are understanding the concept of phonemes, part of learning phonics. Playing games where you take turns saying words that sound the same at the start indicate an understanding of letter sounds and phonics. If a child cannot hear how two words sound the same, it will be difficult to learn to look for the letter patterns those words have in common, an essential part of early reading. C. Can your child identify many different kinds of shapes? Can your child use prepositions? If you draw pictures of a circle and square on a piece of paper, can your child tell you if the square is above, below, beside or on top of the circle? The differences between letter shapes are subtle. Children need to be able to indicate differences in shapes and sizes before introducing letters. D. Can your child identify Letters? Before starting reading instruction, your child needs to be able to identify most letters either by sound or name. There are various theories about which to introduce first. But whichever you choose, your child should know most of the letters on sight before you start working on reading. Refrigerator magnets, blocks, and many toys can be used to introduce this step to your child. E. Can your child read their own name? 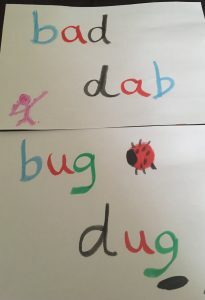 Is your child interested in written words? The first word most children can read is their own name. If you write their name on paper and a few words near it, a child who has reading readiness will ask what the note says. They realize the marks on the paper have meaning and want to discover what that meaning is for themselves. Every child is individual and develops these pre-reading skills at their own pace. Many 5 and 6-year-olds will lack a few skills on these lists. This is normal. You can prepare your child for reading by playing games which target those skills they need to develop. Sometimes, time and practice are all a child needs. However, if your child is 7 or older and struggling with several of the physical items on this list, I recommend you see an occupational therapist for an assessment. It is possible your child would benefit from therapy to catch up in these areas. 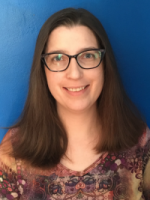 If your child is over 7 and struggling with the language items on the list, you may want to contact a speech and language pathologist for an assessment. Children with dyslexia may also struggle with items on both lists beyond age 8 and require more help with reading instruction than their peers. Value the journey and trust the process. My deep respect for how every child develops at their own pace is why our curricula do not require a child to read independently. The Level Orange: Full-Year curriculum specifically has many activities to help develop the physical and language skills that a child needs before learning to read. Taking the time with your child to help them develop these skills builds a foundation of physical and mental strength which will support you both as you help your child learn to read. Once they are ready, of course. Looking for a curriculum that respects your child's reading readiness?